When it come to Excel formatting, there are so many options and tools that it can be a little overwhelming trying to determine what to use and how to use it. Luckily, there are some beginning steps that can help you focus on where to begin. 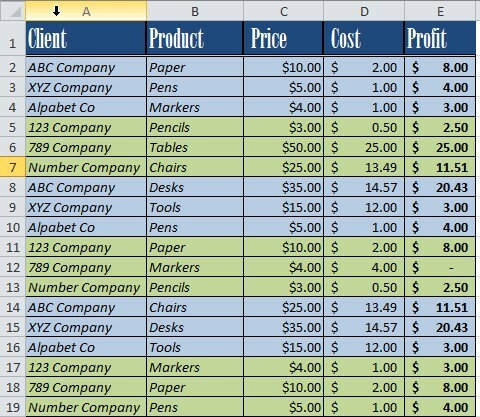 In the following article, we will start with some of the more basic tools and features you can use and then get into an Excel formatting macro as a suggestion on something you can do once you’re comfortable with the basic stuff. When you’re working with a long excel spreadsheet, you might want to see what your column headings are so that you don’t have to keep scrolling up or make a mistake. To make this easy, freeze the column headings. This will always keep your first row with the headings at the top of the columns regardless of how far down you scroll. 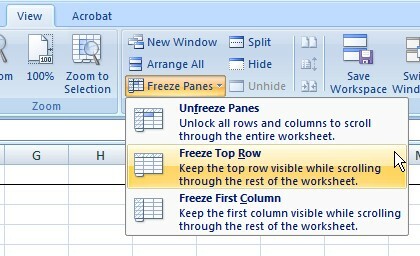 To set this, click on “View” on the tool bar, and then select “Freeze Panes.” Click on the “Freeze Top Row” option. Another way to adjust the column size is to fit it to the text you enter. To do this, first enter your text, then double click the separating line between that column and the column to the right of it. The column will enlarge to fit the text. To copy a formula down the length of a column, click on the cell with the formula. Then, put your cursor in the bottom right corner of the cell until you get the thick, black plus sign, you can either drag the formula down or double click and the formula will be copied down the length of the column. We here at Learn Excel Now hope you feel more comfortable using formatting. Getting social with Excel: please feel free to share this article with anyone you think would benefit from it.